Here, we identify common issues suffered by the plants that grow in our area. Our staff can help you correct any of these issues, come in and see us. Bring us a fresh cut of the problematic tree or shrub, arms length in size, if you can. We not only will identify the issue, but also give you detailed instructions of how to treat it. Check back often, as we will update this site throughout the season as more diseases and bug problems pop up! If you have photos of bugs, fungus and diseases on your trees or shrubs, post them on our Facebook and we’ll upload them to this site to help others identify problems on their own trees and shrubs! 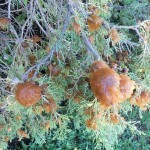 Above are classic examples of Cedar Apple Rust. A fungus that spreads from at least two hosts. 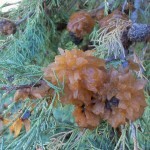 A host in the cedar or juniper family, and a host in the apple or crap apple family. The fungus usually jumps from one host to the next year to year. To fully treat this fungus, you must treat both hosts! (That may mean the other host is in your neighbor’s yard, so have a chat with your neighbor!) 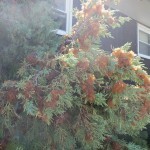 If you think you might have Cedar Apple Rust, please come in and see us soon! This issue should not be left alone, as spores open and constantly keep spreading the disease.